You may print this page, and/or come back to it as much as you like. 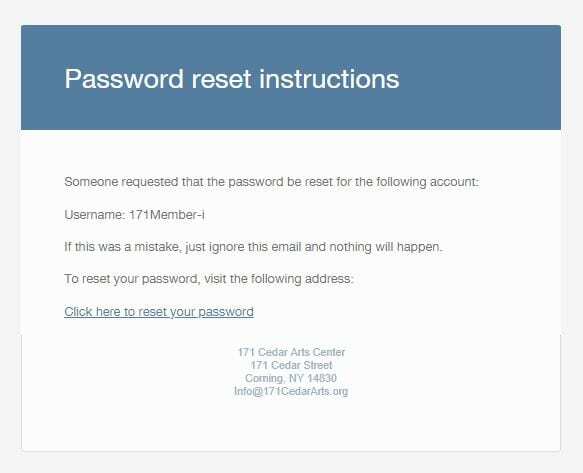 Step 4: You will be prompted ‘Password reset email has been sent. Step 6: You will then be redirected to a page to reset your password. Enter your new password and retype. Select ‘Save’. Step 7: You will be notified with ‘Your password has been reset successfully.’ You may go ahead and login with your new password. Step 8: Once you are logged in you will see a greeting similar to that on the right. Click “edit you password and account details” to finish setting up your account. Step 9: Scroll to the bottom of the page to find the blanks for “Additional Information.” You will need to add your birth date before you are able to register for class. If you have a family membership, you will also want to add the name and birth date of any children or a spouse that also takes classes at 171.